and the works of Dr. Ibrahim Karim. I found this to be wonderfully enlightening information. The series started out with a story about initiates known as Ancient Egyptian Masters of the Net. Upon hearing this I was reminded of ‘Vortex Math’ discovered by genius Marko Rodin. Vortex Math shows us the under laying structure and cyclical patterns creating the manifest reality. I thought the Ancient Egypt-Masters of the Net must be similar to Marko Rodin’s Vortex math diagram. Seen below, it sure looks like a net to me. The Net is the invisible blueprint of energy making up the physical world, the geometrical matrix of matter. Another example from Hindu tradition is called the ‘Jeweled Net of Indra’. Indras Net symbolizes a universe, where infinitely repeated mutual relations exist among all members of the universe. 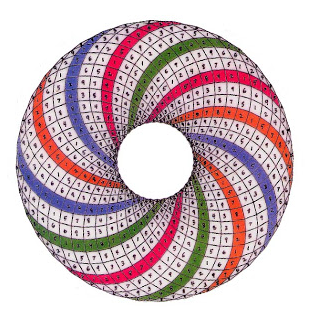 I think this Net concept seems akin to the repeating 1,2,4,8,7,5 pathway in Rodins Vortex Math. His diagram looks somewhat like the VW car emblem. It is said Indras Net has a multifaceted jewel at each vertex, and each jewel is reflected in all of the other jewels. Could this represent the holographic nature of our reality? The initiates who wanted to become Masters of the Net studied this information as a ‘Cannon of Proportion’ for creating great harmonious artworks and temples. The job of manifesting the living Universe (GOD) is the grounding of spiritual essence into physical ream. In fact the information at http://www.secretsinplainsite.com can be useful in an understanding of how we are still using and being affected by proportion today. After all wasn’t Jesus known as a Carpenter; an Architect ? I believe these masters also knew about bio-geometrical energies to keep our bodies healthy. 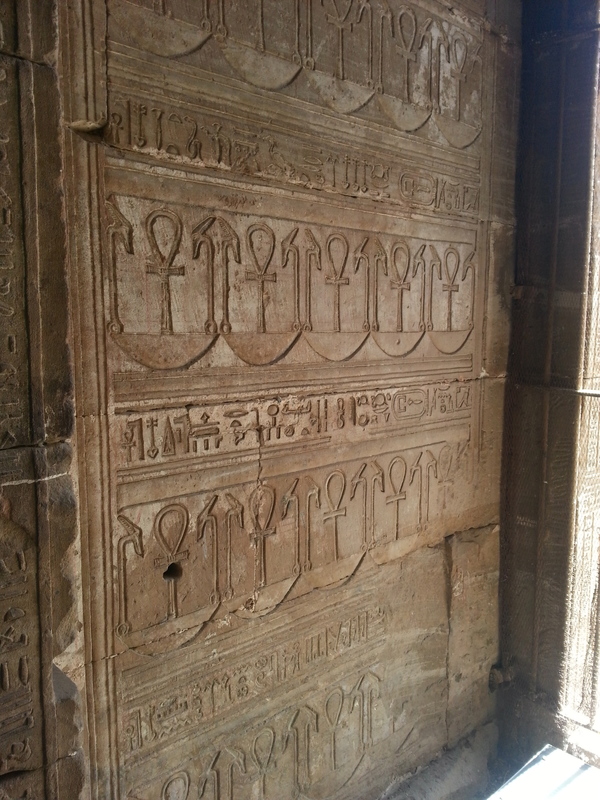 At Karnak Temple we see a mural of the NETER (God) THOTH called ‘Stretching of the Cord’. 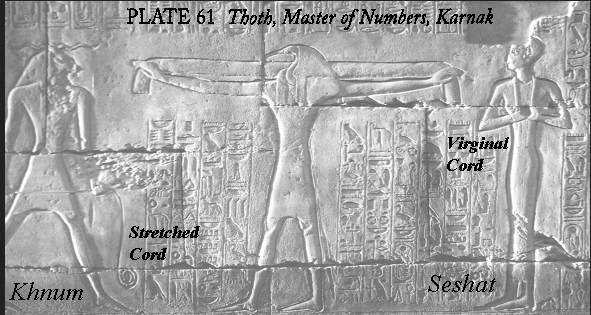 By this action THOTH is creating dimensional movement from the centre into the physical world. I suggest this pattern is how the non-manifest spiritual world gives rise to the manifest physical. It is the pattern the energy of the ‘Net’ takes. 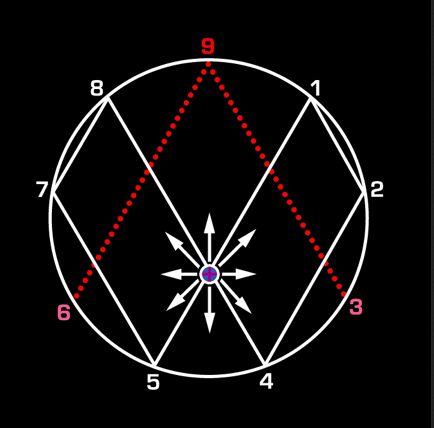 (3-6-9 are non-manifest, the spirit, the invisible flux field animating it all). I suspect 3-6-9 are akin to the BG3 which I will come to. With this understanding Masters of the Net knew the secret to making practical effects in our world. Temple inscriptions say the masters would ‘catch and cast magic’ in their nets. Chapter 153 Book of Dead mentions the details of the Net. Apparently if an initiate understands the Net, they will move through the physical and spiritual worlds with complete consciousness. Not Gods and Goddesses outside of themselves, but fully conscious beings to be interacted with in a fully conscious way. Bio-geometrical forms, as the tool shape called ANK (geometric energy emitters) are intermediaries between the NETERS consciousness and ours. I suspect the actual shapes of the bio-geometrical tools give rise to precise energies used for living practical energy science. NETERS, as forces of nature were considered conscious beings. These beings have resonance with our consciousness through the law of harmonics. So then certain shapes create the bio-geometrical life energies. Dr Karim has called the main 3 balancing energies the BG3. These 3 energies balance all living energy systems. They are manifestations into our physical world that have links into spiritual world. They are 3 divine energies that come together as one. -tombs of Coptic saints in Egypt (pilgrimages) incorruptible body of saints. BG3 are found at sacred sites as well as all human chakras, joints, acupuncture points, cells, genetic structure. WE are NOT adding these to anything, as these are the ESSENCE of living systems. Manifested through design as in a building, body or geometrical form or by direct spiritual connection. Shapes movements or patters can also manifest the BG3 as well as prayer and blessing can. One example is the circle. Shown with the dot at centre to remind us, a circular form emanates BG3 from it’s centre. 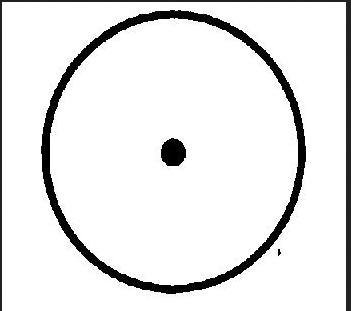 The circle is the basis of all Pagan tradition, as well as being related to the word Church. The Dome shape and the Pyramid shape also generate these BG3 energies. 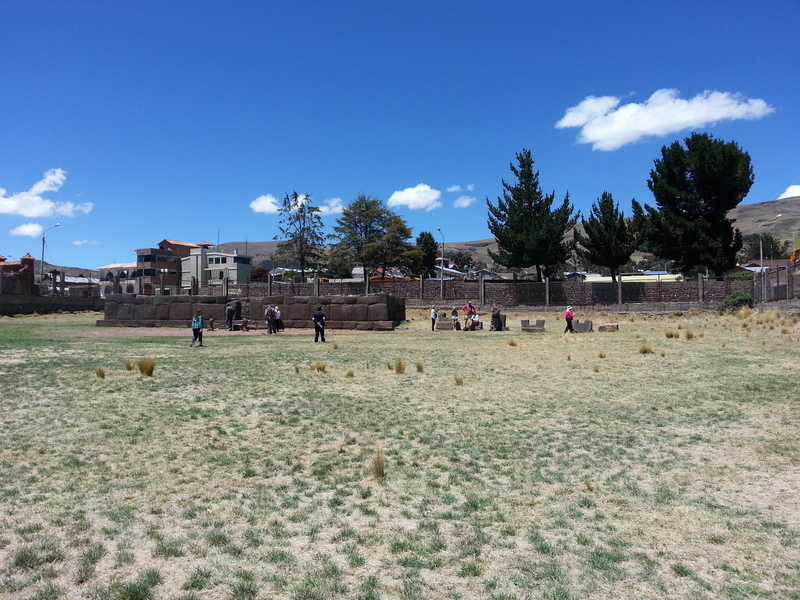 On my recent trip to Peru/Bolivia I visited a special ancient site called INKA UYU. 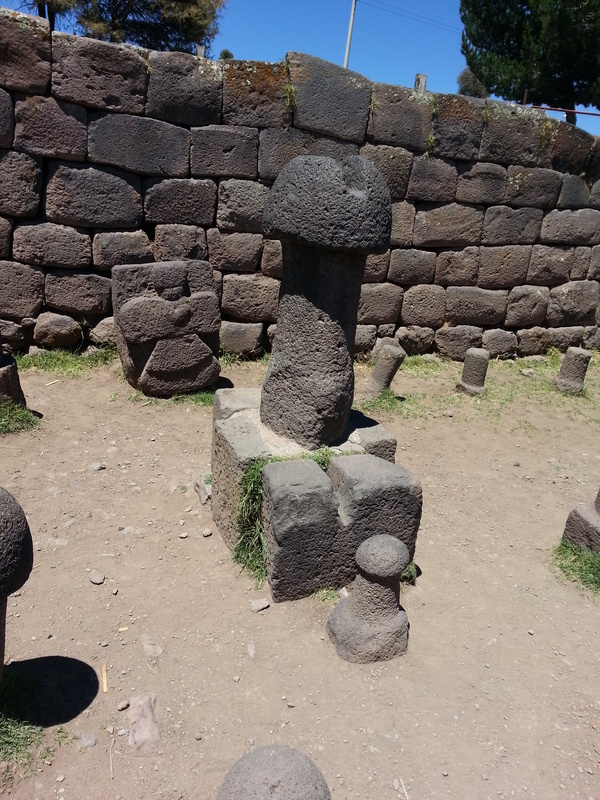 Affectionately known as the Mushroom Fertility Temple. Notice the angel with heart in centre carved out and lying against back wall. I wonder if this is a representation of BG3 #2 Spiritual light, atmosphere of angels, higher harmonic of ULTRAVIOLET. After researching bio geometry I realized that these little mushrooms were domes. I shared with the group and we all smiled. 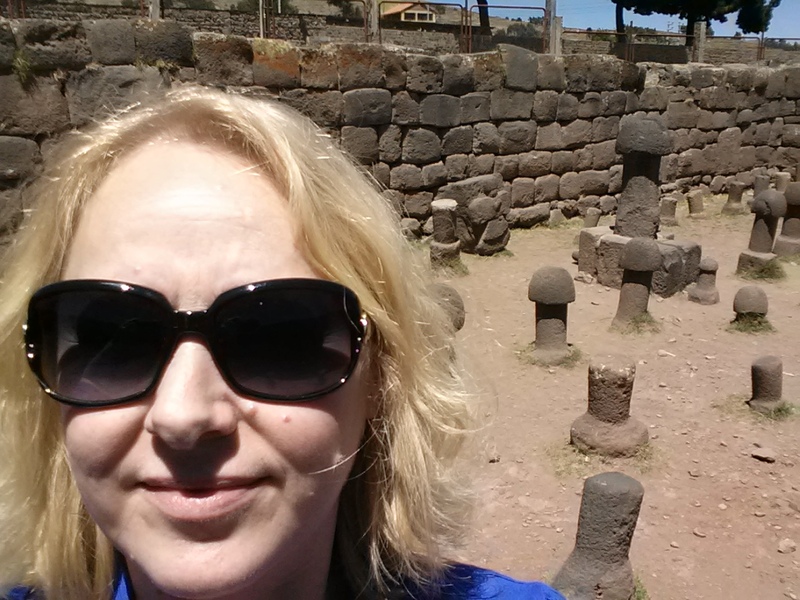 No wonder this is referred to as a temple of fertility with all these little domes sending out life force! Interestingly there is a church next door to this site, most sacred sites being usurped by history. I noticed that some of the little mushrooms had been knocked down and some even buried upside down. I guess to stop their power from radiating out. In fact they were pumping out BG3 energy still! We can see another example of bio-geometrical application in the Egyptian Neter Sekmet and her consort Ptah. 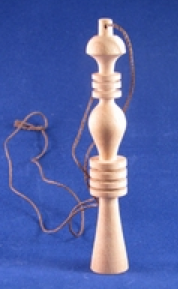 The Egypttian NETER Sekmet is connected to the Wadj form pendulum (seen below). According to Dr. Karim’s work, the BG3 #1 Spiritual Carrier wave emanates from its tip. It is known that the NETER Lioness Sekmet is connected to this form and this energy. 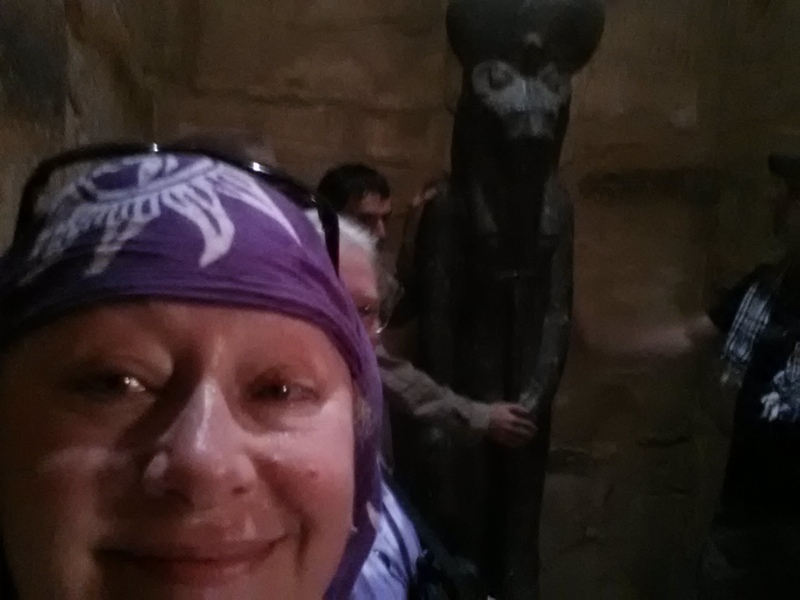 This is a photo of me after a powerful experience with Sekmet at Karnak Temple April 2013. There is a benevolent side of Sekmet and an killer side of Sekmet, she is both harmful and beneficial as with the energy coming from her tool shape. Each bio-geometry also has opposite qualities and in more complex studies you can learn more about ‘fixes’ that can be used to avoid harm. For simplicity let’s focus on the basics. Sekmets consort is PTAH, the form of the Djed pillar seen below. When tested for bio-energy, the base of the Djed seems inert of divine energy on it’s own. However the union with Sekmet gives rise to a child, Nefertum, meaning ‘The Beauty or Fullness of Creation’. When the Wadj is placed into the top of Djed it allows all BG3 to appear from bottom of its base. 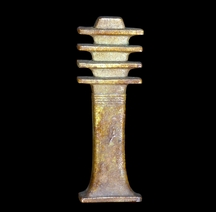 This connected form is depicted below and can be worn as a necklace. Very simple yet powerful stuff. I believe many of the scepters and tools depicted in Egyptian artwork are actually bio-geometrical energy tools. The Ank shape and the fork footed Earth tool are two that come to mind. On my trip to Egypt I took this photo below so you can see those tools. 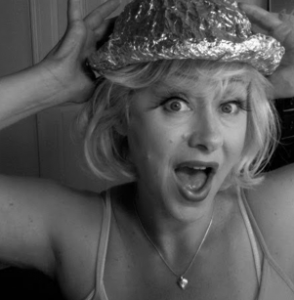 There is an energy science encoded in this ancient information. Bio geometry is everywhere for us to enjoy and use for health, harmony and happiness. To be unaware is to be vulnerable to the harmful side of this natural powerhouse. To be aware is to be astounded at natures life giving proportions. * This is my own comparison and not to be confused with the ‘Family Groups’ of Vortex math which are 2-5-8/1-4-7/3-6-9.